April 13 through July 14, 2019: Laurie Shelton’s “Cows” in the Spotlight Gallery. Painter Laurie Shelton is a longtime Napa Valley resident whose paintings of farm animals are highly prized from St. Helena to Palo Alto to Paris. Having lost her husband to brain cancer, the image of a cow became the vehicle for her to work through her emotions. 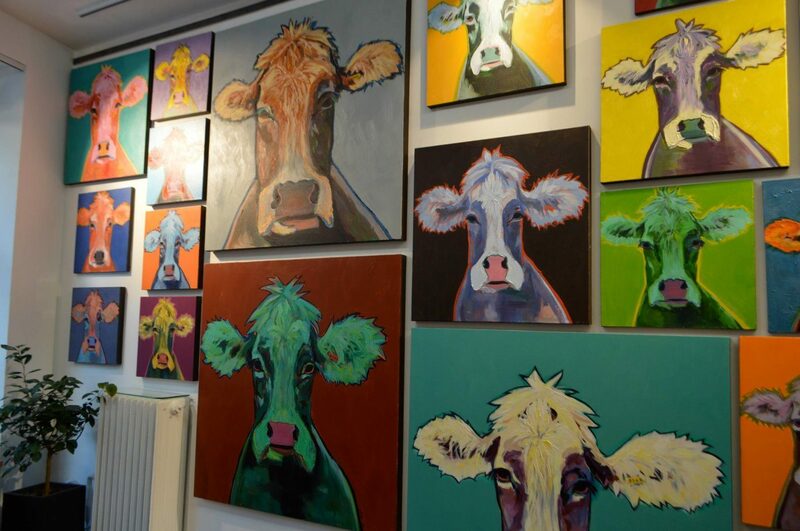 She paints figures and portraits but it is the cow image where she has found a release. This exhibition will include new works as well as a “cattlle roundup” of works from the private collections of her fans. Paintings for sale during the exhibition will benefit the Museum’s arts and education programs. (image above: Summer Cow, 2016. image below: Shelton on display at a gallery in Paris, 2016).